← So Your Brother Snorz. It Could Be Worse. If you didn’t grow up on a farm, you may not know there is a huge difference between a pet cat and a tom cat. To be blunt, the former you can pet; the latter you stay away from, unless you want a trip to the city hospital for stitches. Still, both types of cats help control the mouse population. Conflicts are rare if everyone stays in their place. But sometimes a clash of species occurs. HS knows that. When she was six, the tom cat that roamed the outskirts of her family’s farm got a little too close. Well, much too close, especially to their pet cat (Wild) and her kittens. HS’s dad took over. Here is HS’s first grade journal entry, a letter to her father about how he handled the tom cat versus house cat conflict. I remember when we shot the tom cat. He was a bugger. He was stupid. He killed 3 batches of kittens. We think that he killed Wild. You shot him (Good Dad) in the head. It was funny, but when we found Wild we were sad. You buried the tom cat and Wild in the garden. I’m pretty sure HS (a.k.a. Bug) has a future in humor writing. Here’s hoping all our weekends are tom cat free. To read more about tom cats, guns, and growing up as a farm girl, check out my post today at Ironic Mom. Posted on May 6, 2011, in Diaries and Journals, Views of Adults and tagged Chase McFadden, farms, Father's Day Letters, Leanne Shirtliffe, pet cats, Stuff Kids Write, Stuffkidswrite.com, tom cats. Bookmark the permalink. 23 Comments. Love it. That stooped bugr! I wonder what the teacher thought of this entry? Hilarious stuff! Love the site guys. Great work! I heard it made its way around the staff room. Jess, we’ll have to Skype sometime, so I can hear you! One of the greatest lines in American literature ever. Look out Steinbeck. You, too, Franzen. I wonder where she got that one? I love kids – you can always count on a good laugh from ’em! (Or at them – not that I’d do that). You shot him in the head. It was funny. Thanks, Julie. We’re having fun with it. 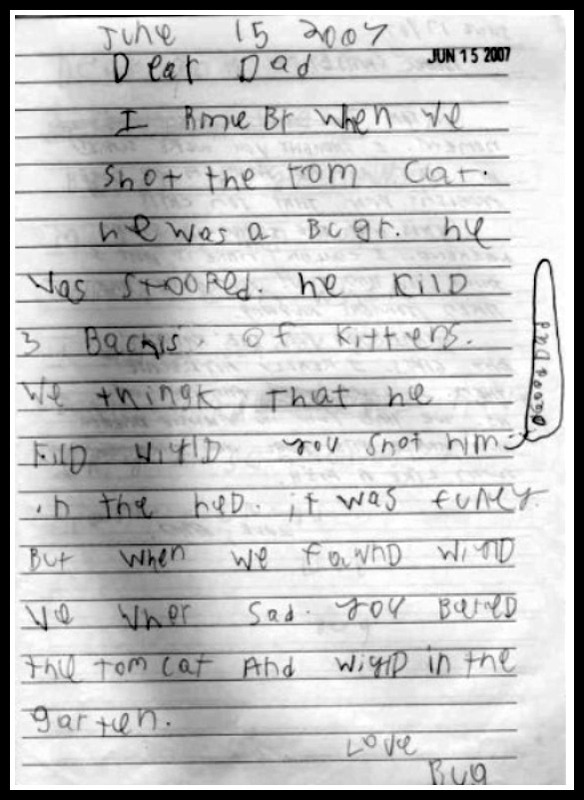 I remember the toms killing the barn kittens at my Grandma’s house…nobody ever shot them though! He was a bugr. Awesome! I’m encouraged that there are other children besides mine that might think it’s funny when something gets shot in the head. You should get in touch with Brenda Borley. She has an absolutely hilarious piece that her daughter wrote describing how her Dad was a hero for shooting the stray cats. It was for Father’s day. One step ahead of you, as always. This is that piece.